Esther Marie Hudson Blick obituary. Carnes Funeral Home. Jun 17, 2012 The Carnes Funeral Home Staff offers our sincerest condolences to the entire Blick family. It was our honor to serve your family. Esther Marie Hudson Blick, daughter of the late Fred and Rebecca Hudson, was born in Gregg County, Longview, Texas. Mrs. Blick was an elementary school teacher, who taught in the Kilgore ISD, Galveston ISD and the La Marque ISD. for over 50 years. She was well known, respected and loved by her peers and student’s alike. She graduated from Bishop College with a major in French. Mrs. Blick was married to the late Richard H. Blick from Marshall, Texas. Mrs. Blick was a member of Alpha Kappa Alpha Sorority, a very active member of the United Church Women, a member of Galilee United Methodist Church where she was active in the Sunday school and the choir. Mrs. Blick was a long time resident of the Texas City area until her health began to fail and she moved to Spring, Texas to live with her god-daughter and her daughter. Mrs. Blick passed from this life the evening of April 7th at home with her family. She loved life and enjoyed life. 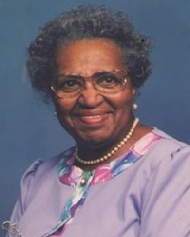 Mrs. Blick leaves her god-daughter, Alberta Wade, Spring, Texas; god-granddaughter, Alante’ Wade, Spring Texas; cousins, Quida Parham, Bethesda, Maryland, and Roamey and Sharon Latham, Overland Park, Kansas; a sister-in-law, Mrs. Mae Frances Bausely, Los Angeles, California and a host of friends. A Public Visitation will be held Saturday, April 16, 2011 at 10:00 AM; the AKA Sorority Memorial Service will began at 10:30 AM followed by the Funeral Services at 11:00 AM. All services will be held at Galilee United Methodist Church 102 9th Street South Texas City, Texas. Reverend Robinson will officiate the services. Burial will follow at the Jordan Valley Memorial Park Cemetery in Longview, Texas. Arrangements are with Dorthea Jones, Funeral Director and Carnes Funeral Home 3100 Gulf Freeway Texas City, Texas 77591. Memorials may be sent to the funeral home.